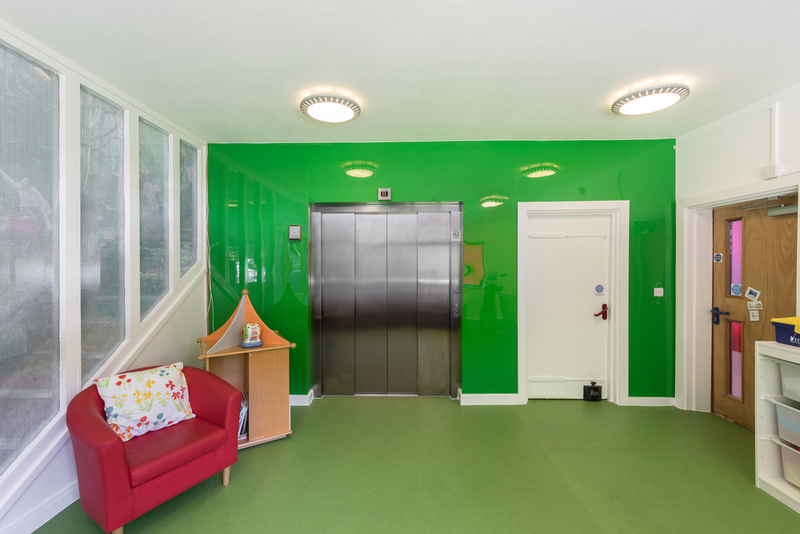 The brightest and boldest Altro floor and wall products have been used to refurbish Haven House Children’s Hospice, in Woodford Green, Essex, with rainbow staircases and cleverly colour zoned areas making the facility strikingly beautiful inside and out. The hospice provides the highest level of respite and palliative care to families and young people from birth to 19 years old who have life-limiting or life-threatening conditions. In the hospice children benefit from a range of play activities, as well as day and overnight stays. 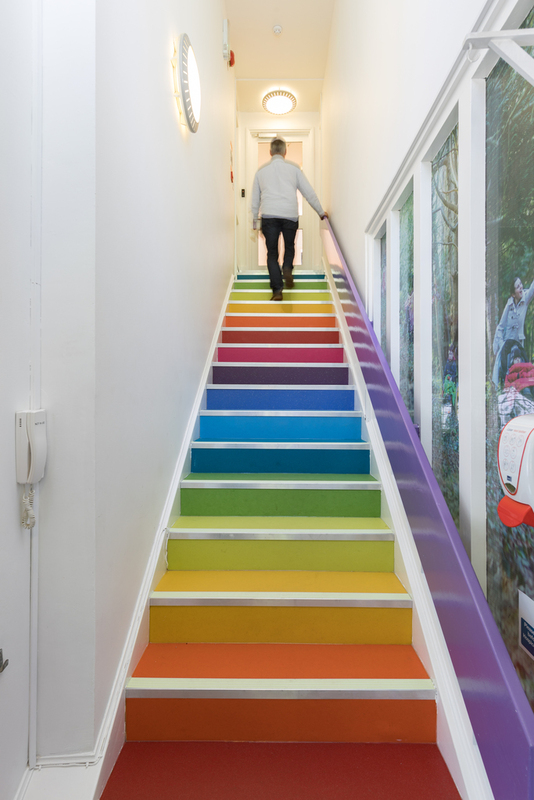 The Haven House rainbow staircase has been created from different colours of Altro Suprema and Altro Walkway 20 safety flooring. Altro Wood safety flooring in Bleached Oak has also been fitted in meeting rooms, the cafe area, all corridors and bedrooms, creating a homely, non-clinical feel. The orange-themed changing room at Haven House has been fitted with Altro Whiterock Satins hygienic wall sheet in the shade Bergamot, with Altro Suprema safety flooring in Tangerine. 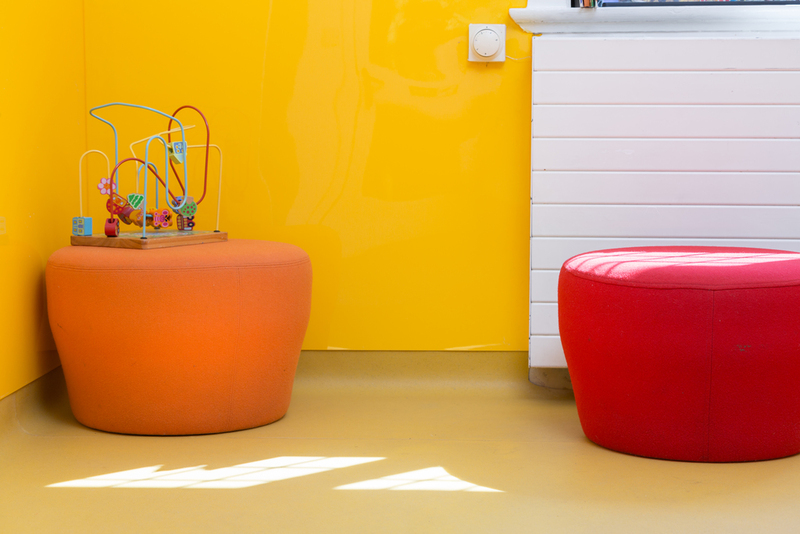 To create the yellow theme in the waiting area, the design team chose Altro Whiterock Chameleon in the shade Bee, and Altro Suprema flooring in the shade Taxi Cab. The disabled toilet has a purple theme, with Altro Whiterock Satins on the walls in the shade Viola, and Altro Walkway 20 safety flooring in the shade Silk. The blue areas have Altro Whiterock Chameleon wall sheet in Ocean Blue and Altro Walkway 20 safety flooring in Lupin. Altro Whiterock Digiclad walling was used to create some wonderful water-themed artwork in both the hydrotherapy bathroom and teenagers’ en-suites. 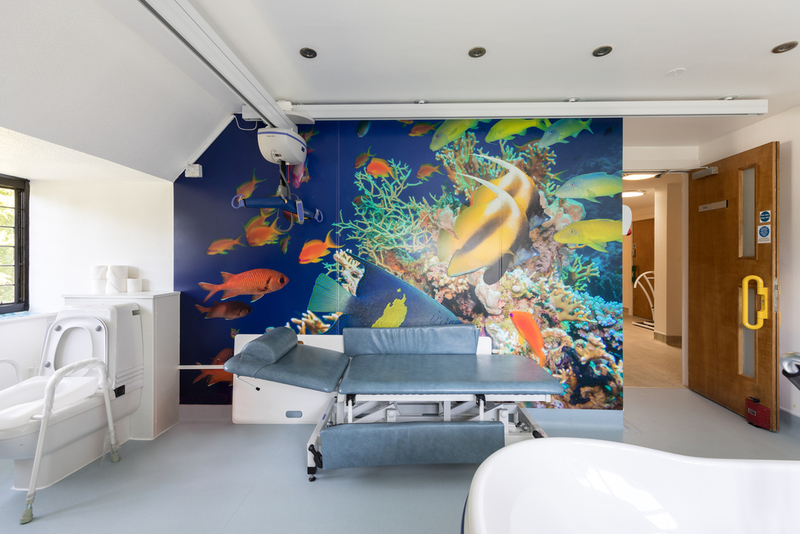 “The aim was to make these rooms look colourful and less clinical, but the artwork also needed to be permanent, hygienic and hard wearing," Judi said. "Altro Whiterock Digiclad is perfect because it’s so simple, yet very effective. You can create any design you want, it’s wipe-clean, hygienic and it won’t peel off. 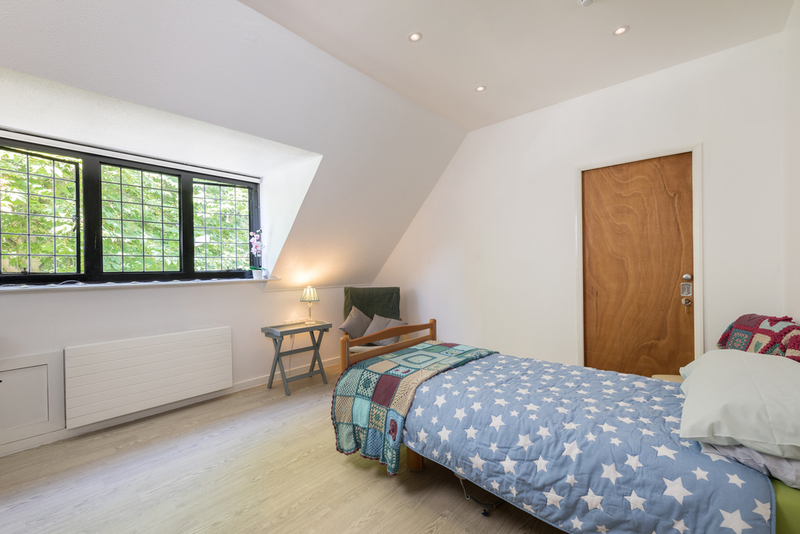 The hydrotherapy bathroom and the teenagers’ en-suites were also fitted with Altro Pisces safety flooring in the shade Jellyfish. “Safety underfoot in wet areas is vital, for both staff and children, and Altro Pisces has been specifically created for this need,” Judi added. 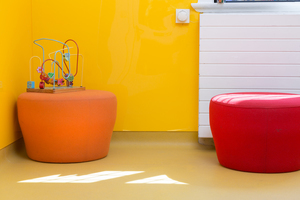 Haven House director of care Eileen White said: “The wonderful colours have helped us to create an uplifting environment for staff and young people alike."